Tape the two short pencils either side of the longer one. (The launcher) Cut a piece of card about 2cm by 10cm, and then mark two holes either side of the centre. Then punch two holes at these points ,using another pen or pencil. It is a good idea to put something soft under the card when you are doing the punching - otherwise you will probably either make a hole in your table, or your hand. Make sure the holes are quite loose on the launcher, so that the card can lift off easily. make two diagonal flaps on opposite corners of the piece of card, both pointing down. Put the piece of card on the launcher and spin! With any luck, and a bit of practise, you should be able to get the helicopter to take off and fly for 3-4 seconds. 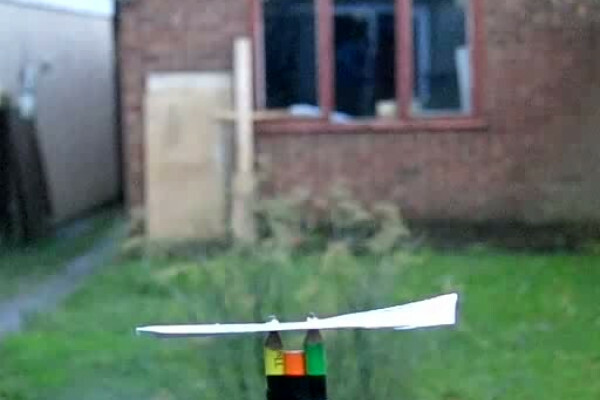 Essentially you have built a rotating wing. The wing is moving through the air even if the card stays over the same place, therefore it can hover. Do pilots consider Earth's rotation? How was Curiosity's Landing Mechanism Tested?